Blazers Clinch Homecourt With Harkless' Game-Winner In L.A.
LOS ANGELES -- Portland's penultimate game of the season versus the Lakers Tuesday night got off to an interested and unexpected start with Magic Johnson, Los Angles' President of Basketball Operations, resigning a few hours prior to tipoff. And while the end of the actual game wasn't as surprising, it ended up being just as noteworthy. After missing his first three attempts, Moe Harkless made his only three-pointer Tuesday night as time expired to lift the Trail Blazers to a 104-101 victory versus the Los Angeles Lakers in front of a sellout crowd of 18,997 Tuesday night at Staples Center. "I seen them doubling Dame (Lillard), I knew he was going to pass to CJ (McCollum), my guy had to rotate," said Harkless. "So I was open, he saw me and I just took the shot with confidence." With the win, the Trail Blazers have clinched home court advantage in the first round of the 2019 Western Conference playoffs, though which team they’ll face and what seed they’ll end up with is still to be determined with one game to play. “It feels good," said Trail Blazers head coach Terry Stotts of clinching home court. "It was the goal going into this week to clinch home court, and we did that. And it’s good to know that we start at home." The Trail Blazers have now secured home-court advantage in the first round for the 14th time in franchise history and are 6-7 all-time in those series. It is also the first time in nearly 20 years that the Trail Blazers have earned home-court advantage in consecutive playoffs. "It was great (to secure home court)," said Damian Lillard. "Tonight was a game we knew (Los Angeles) had nothing to lose, they was gonna come out and compete and it wasn't going to be easy," said Damian Lillard. "Regardless of what their record is or who was on the floor, we knew it was going to be a fight." That it was. Despite playing without the majority of their regular season rotation, the Lakers entered Tuesday's game off consecutive victories versus the Clippers and Jazz, teams also destined for the 2019 postseason. And while the Trail Blazers went up by as many as 11 points in the second quarter and by 10 early in the second half, the Lakers finished the third quarter on a 13-2 run to take a 74-73 lead into the fourth quarter. The Lakers held the lead, albeit a slim one, for the majority of the fourth, and after Mike Muscala got a tip in to give the Lakers a three-point lead with 1:48 to play, it started to look as though Portland would leave Los Angeles needing a win in their final game of the season in order to start the postseason at home. But on the next possession, Harkless finished a finger roll and-one to tie the game at 97-97. He'd earn a trip to the free throw line on the next possession as well, giving the Blazers a two point lead, though Lakers guard Alex Caruso would do the same, tying the game again at 99-99 with just over a minute to play. Caruso and Harkless would match each other again, with the former hitting a 20-foot jumper and the latter finishing another layup at the rim to knot the game for what would be the final time at 101-101 with 33.3 seconds to play. 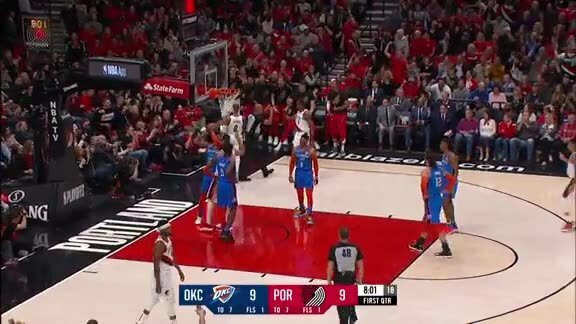 But while Harkless would ultimately hit the game-winning shot, he was only able to do so thanks to Seth Curry picking Caruso's pocket for his third steal of the game with 18 seconds remaining. "Key play in the game, knew we had to get a stop right there," said Curry. "Caruso had it going a little bit, so I just tried to sit down and guard him. He was going right a lot throughout the night, so playing a game within the game, kinda setting that up a few plays before. Almost had one, he got by me, got the layup so got another chance at it and was able to get the stop." Lillard handled the ball at the top of the three-point line while he waited for time to run off the clock to ensure Portland would either win the game or go to overtime. The Lakers eventually sent the double team, setting off a chain reaction leading to Harkless hitting the corner three for the win as time expired. "Pretty much this whole season, end of quarters, end of games, whenever there's a chance for us to go ahead, like a last shot, teams don't let me go no more, just running two people at the ball," said Lillard. "I heard them yelling it from the bench so I just kept looking at the clock and trying to see where they were going to come from to try and position myself to make a pass. My first look I was looking at CJ and I saw they came off of our big, saw they left from him and Caldwell-Pope was kind of playing in between him and CJ. So I was trying to keep him honest, if he go run to CJ, I was going to throw it to the big. If he stay on the big, I was going to try to hit CJ for the last shot, but they came quick, he was still with the big. So I hit CJ, Moe just popped out to the corner, CJ made the play to Moe. Moe had been scoring and hitting free throws the whole fourth quarter. He came up big for us." The Trail Blazers were led by Harkless, who scored 12 of his season-high 26 points in the fourth quarter to go with eight rebounds and four blocks. He made just one of his four three-point attempts, that being the game-winner. “Maurice Harkless had a tremendous game," said Stotts. "He made big plays at the offensive end, arguably one of his best games of the season. He was really active, worked the baseline well, obviously hit the big shot." Enes Kanter kept Portland afloat for much of the game before finishing with 22 points, 16 rebounds and two assists in 37 minutes. Lillard went 6-of-16 from the field and 3-of-10 from three for 20 points to go with eight assists, four rebounds, three steals and a block in 36 minutes. Curry came off the bench to score 19 points while also adding three steals, two rebounds, an assist. CJ McCollum went 5-of-13 from the field and 1-of-6 from three in his second game back since missing 10 games due to a strained muscle in his left knee. Six Lakers finished in double figures led by Kentavious Caldwell-Pope, who led all scorers with 32 points. Mike Muscala poured in 16 points while both Alex Caruso and Johnathan Williams added 12 points. With homecourt clinched, the Trail Blazers now return to the Moda Center to wrap up their regular season Wednesday versus the Kings on Fan Appreciation Night. Tipoff is scheduled for 7:30 p.m.